I’ve had eczema my entire life. After getting pregnant with Skibbles, our toddler, it magnified greatly. Where I have breakouts varies from my arms, to my legs, etc., but since having Baby, it’s primarily stayed on my hands. I remember seeing a dermatologist who said, “I typically recommend avoiding water as much as possible and allowing it to clear up on it’s own.” I laughed out loud. Literally. Here I am, a mom, partial food blogger, and this dermatologist recommended avoiding water. I have to wash my hands at least 562 times a day just because of diapers and well….kids. They’re messy. Unabashedly messy. There was no possible way to avoid it. Obviously, I needed to find my own solutions to this problem. 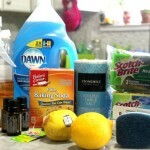 The first thing I did was start to make my own DIY homemade cleaners. It was surprisingly easy to make, let alone much cheaper, and much safer — not only for my skin, but I no longer had to worry about harmful chemicals near my girls. I could even feel comfortable asking our toddler to clean up her own messes with our DIY all-purpose cleaning solution. That’s definitely a parenting win! 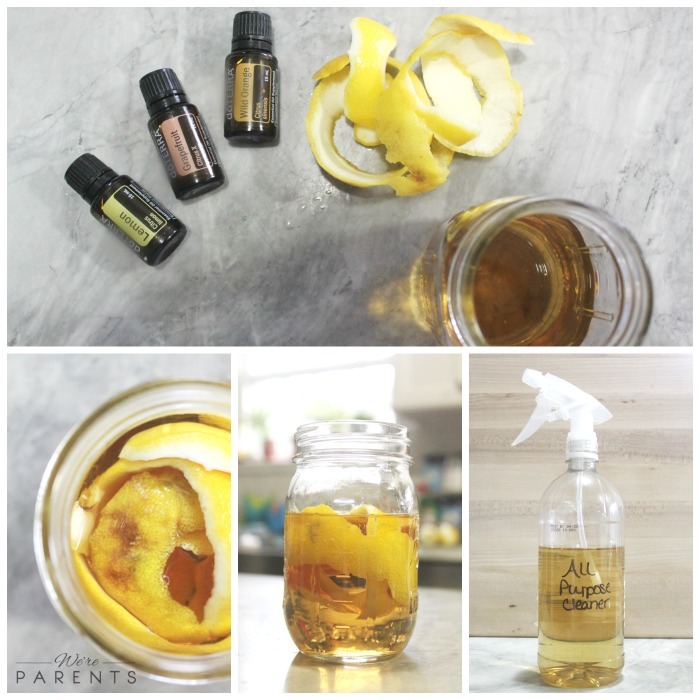 Today, I’m sharing three of our favorite DIY Home Cleaners with you! 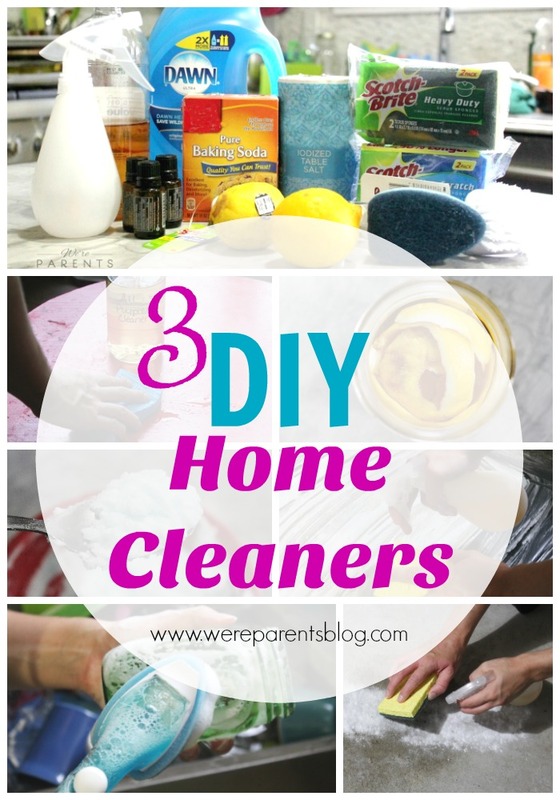 An all-purpose cleaner, an oven cleaner, and a garage cleaner. In a sealable container, add the lemon rinds and apple cider vinegar. Let sit for two weeks. After two weeks, remove lemon rinds and pour liquid into a spray bottle. Add essential oil and water. Use as needed with Scotch-Brite™ Brand sponges. In a bowl, combine baking soda, salt, dish soap, and two tablespoons of water. If needed, add the additional tbsp of water until a paste forms. Spread paste over oven surfaces. Spray all-purpose cleaner over paste and remove with Scotch-Brite® Heavy Duty Scrub Sponge. Spread baking soda over problem area. Sweep up baking soda, then spray all-purpose cleaner and scrub with Scotch-Brite® Heavy Duty Scrub Sponge. Depending on the stain and how long it's been there, may need additional applications. Repeat above steps as needed. Best if done immediately after stain occurs. We recently needed to make more all-purpose cleaner, so we headed over to Target to grab the ingredients we were out of at the time. While there, we grabbed our favorite Scotch-Brite™ Brand sponges as well. 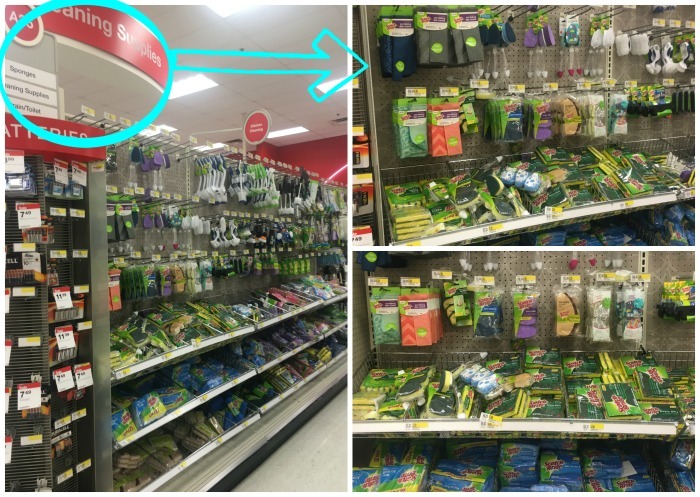 I had no idea before, but they actually have a color coordinated system where Green sponges are for Heavy Duty and Blue ones are Non-Scratch. Now I always know which ones I want while shopping.Scotch-Brite™ Brand makes the right tools for every surface that I’m cleaning from the kitchen to bathroom to even the garage. It makes things so much easier. I love the Scotch-Brite® Non-Scratch Soap Dispensing Dishwand for cleaning our dishes. Not having to stop to add more soap while I’m washing is always one of my favorite perks of using these. 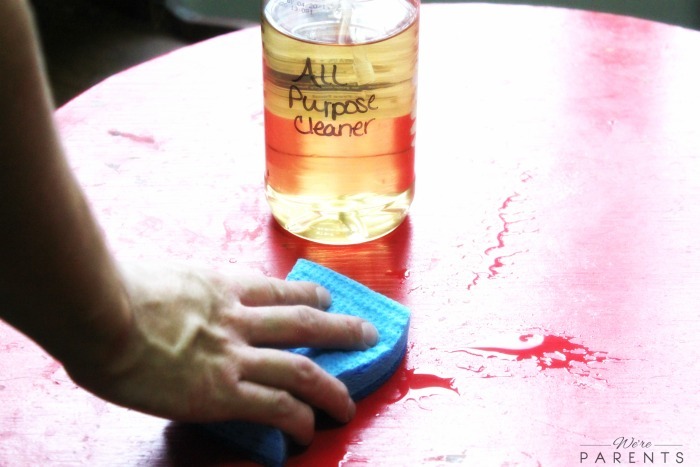 For our all purpose cleaner, we let lemon rinds sit inside apple cider vinegar for two weeks. Then, remove the rind, add some essential oil and water, and BAM! Done! Time to clean. 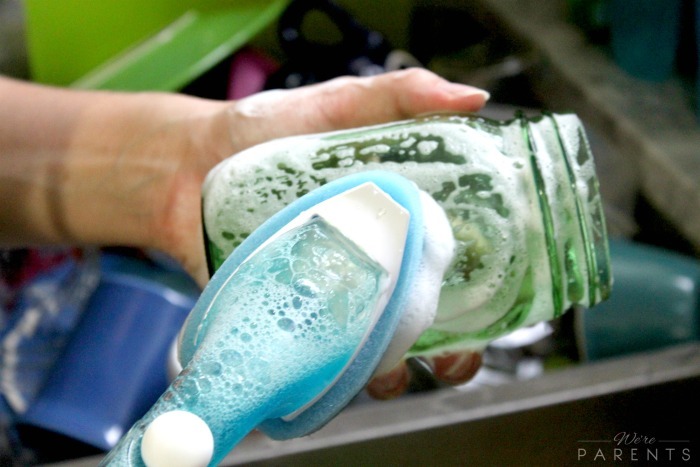 This all-purpose cleaner is great and I love pairing it with the Scotch-Brite® Non-Scratch Scrub Sponge to clean without scratching things like our table, windows, countertops, and stove. For the oven, we combine our ingredients until a paste forms, then spread it out and let it sit over night. The next morning, I spray a little all-purpose solution on it and it instantly foams up. I then use the Scotch-Brite® Heavy Duty Scrub Sponge to clean the mess off. This heavy duty sponge cleans tough messes, like the oven or grill, 50% faster than other competing sponges. 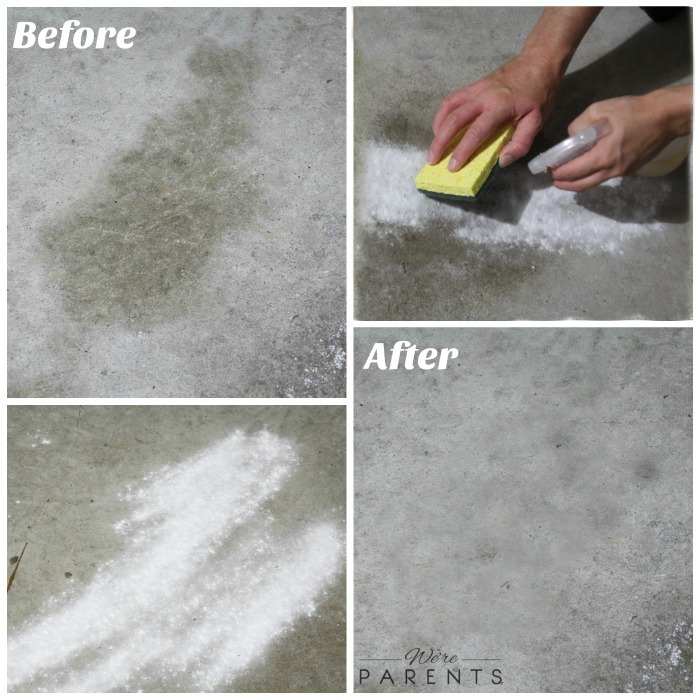 For the garage, we just use baking soda overnight, and then our all-purpose cleaner. We use this as soon as we make a new stain so it’s easier to come up. For set-in stains, you may have to reapply a few times. The Scotch-Brite® Heavy Duty Scrub Sponge is perfect for getting these stains up. 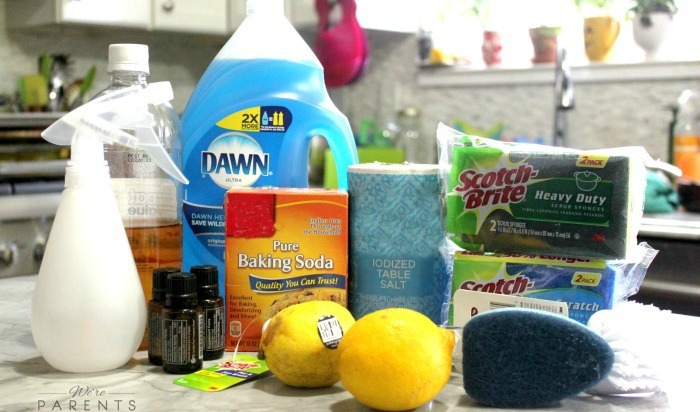 These DIY Home Cleaners paired with Scotch-Brite™ Brand sponges are the perfect way to clean up all your messes! Always make sure to check your Target Cartwheel app too, because Target frequently has even more savings off their already great prices! 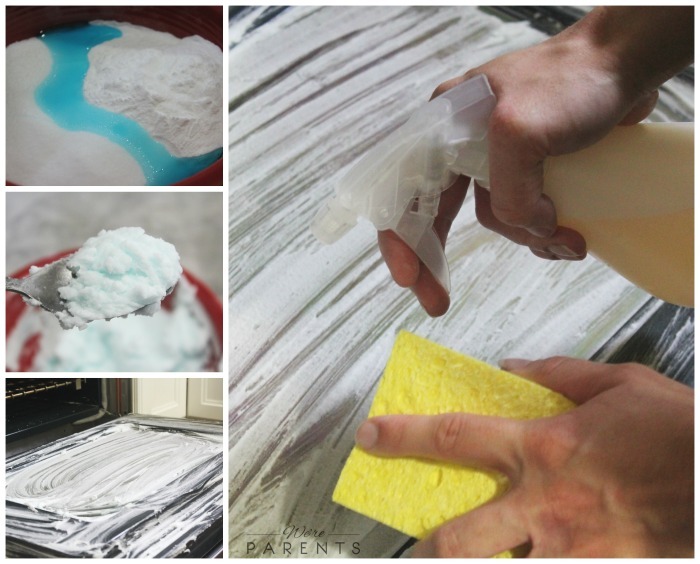 Grab even more cleaning ideas with Scotch-Brite™ Brand from other bloggers here.